Brazil ended Germany’s 22-game unbeaten streak in March, as Manchester City forward Gabriel Jesus scored the winner in a tight international friendly in Berlin – the first time the two nations had met since the Germans humiliated Brazil with a 7-1 victory in the 2014 World Cup semi final. Jesus’ diving header in the 37th minute was the only goal of the game, but despite it being a friendly the result was important for Tite’s team as they built towards Russie. 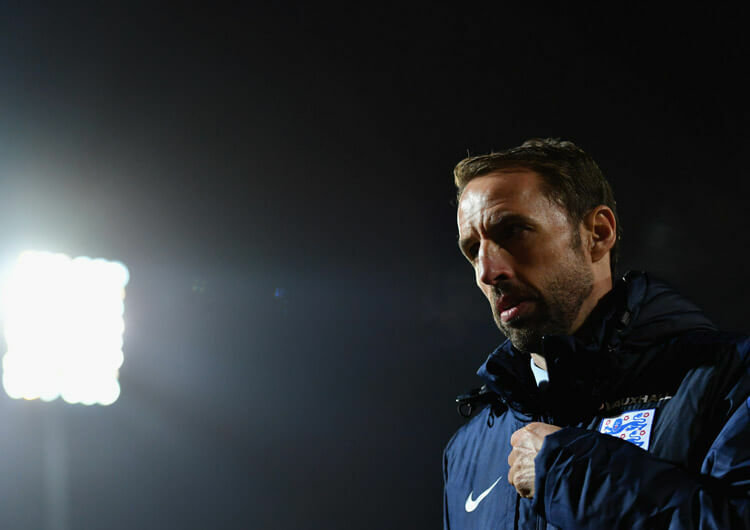 Here, our professional coaches look back on the action, assessing the tactics and key moments from a game featuring two of the World Cup favourites. 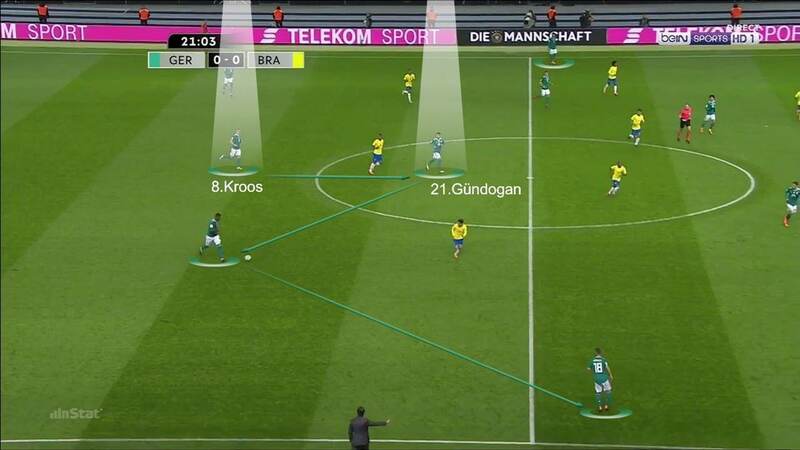 Joachim Low opted for a 4-2-3-1 formation and used the same system in defence, with an intermediate block and zonal marking. 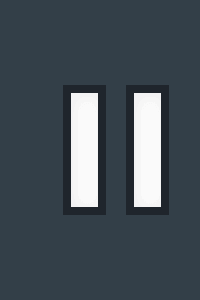 At the first line of pressure, Germany tried to tempt Brazil goalkeeper Alisson to play directly into Gabriel Jesus by closing down his nearby passing options. After going a goal down in the second half, they intensified their pressing game still more in order to win the ball back more quickly. Germany struggled to reorganise defensively when they lost the ball in the rival half. If either of their centre-backs or full-backs got caught up the pitch, they were slow to recover in transition, leaving empty spaces which the Brazilian attackers were able to exploit. The Germans struggled to assert themselves in the attacking phase. Goalkeeper Kevin Trapp exposed his weakness on the ball, and was unable to help his back four play out to attackers in advanced positions. Their tempo on the whole was too slow to put their opponents under pressure, and they failed to keep possession for any prolonged period of time. Toni Kroos and Ilkay Gundogan did impress in the centre of midfield, however. One of the two would slot in between their centre-backs, helping the back line on to the front foot. 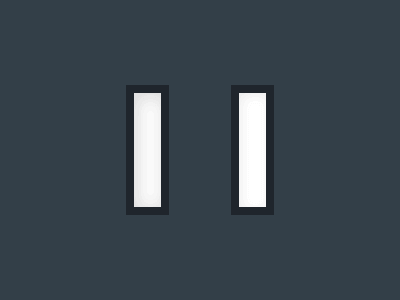 They would then have to direct the attacks out wide due to the good positioning of their opponents. Their attackers spread wide to receive possession, but failed to get in behind and challenge the last line. On the counter-attack, Germany failed to find the players who were best placed to launch a dangerous move. Their first pass after turning over possession was pinpointed at one of their three attacking midfielders, but they failed to lose their markers. This left them liable to tactical fouls or to being dispossessed. In this sense, Julian Draxler, Leon Goretzka and Leroy Sane wasted their chance to exploit the space and forge a genuine presence in the attacking third. Late on, Low set up with two lines of players in the opposition half. 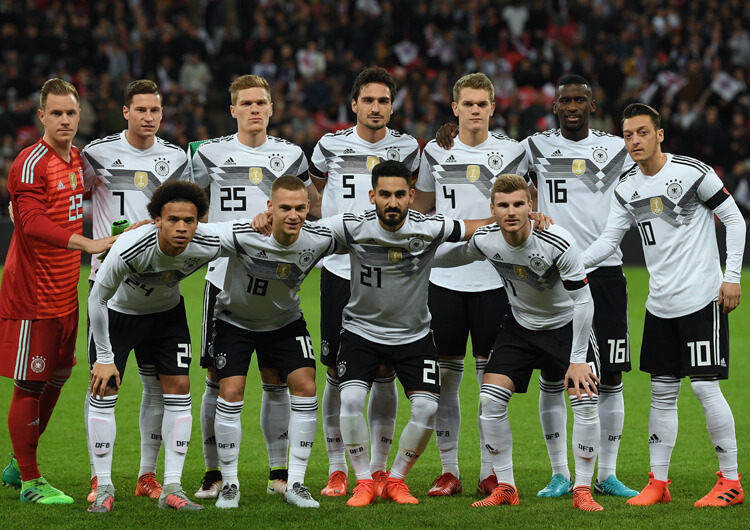 Substitutes Timo Werner and Julian Brandt pushed up next to fellow replacement Sandro Wagner, while Draxler dropped back to help surround the central midfielders. Their objective was to prevent passes from penetrating their defensive unit, conscious of the threat of their rival attackers. The midfield partnership between Toni Kroos and Ilkay Gundogan worked well in possession. One would slot in between the centre-backs, helping the back line on to the front foot. They would then direct the attacks wide. In the second half, and a goal down, Germany intensified their pressing game in order to win the ball back more quickly. Low now had two lines of players in the opposition half.  Germany struggled to reorganise defensively when they lost the ball in the rival half. The back four were often to slow to retreat back into their shape in transition, leaving themselves open to the counter-attack. The home side looked capable of causing Brazil problems at set-pieces. Had their deliveries been more precise, they might have threatened more on goal. 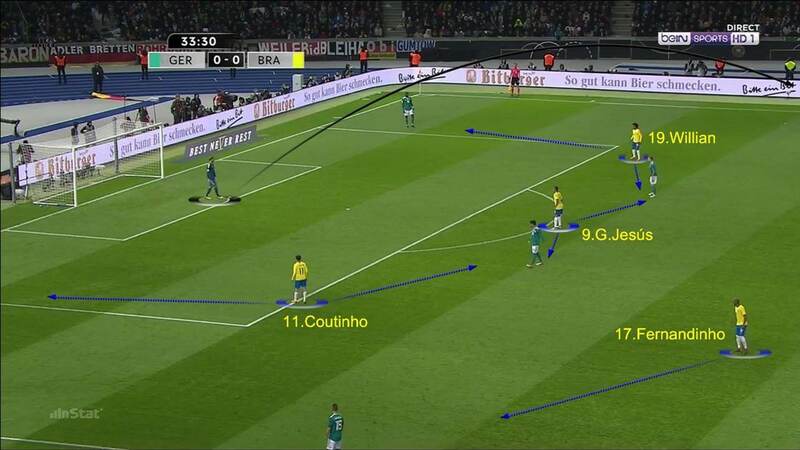 Brazil started in a 4-3-3 formation in attack and in defence, employing zonal marking and a high press. The ‘trivote’ of Paulinho, Casemiro and Fernandinho were particularly solid, offering constant support for their teammates. Brazil made it difficult for Germany to play through the thirds. Their three most advanced players slotted into gaps in the opposition back line, while Paulinho and Fernandinho positioned themselves close to the German full-backs. This forced Kevin Trapp into reluctantly going long. 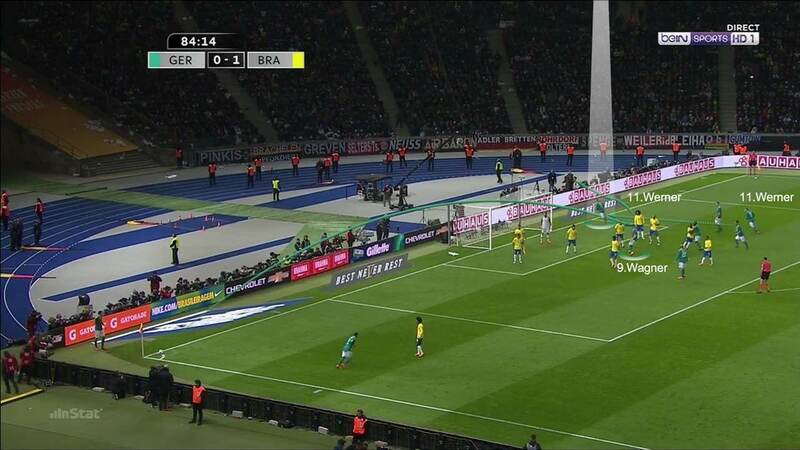 Brazil built an impenetrable defensive structure inside their half of the pitch. Willian and Coutinho held their position to support their full-backs, while Paulinho, Casemiro and Fernandinho concentrated on marking Germany’s key men in the central channel. Brazil’s attackers caused problems for the German defence in the final third and found plenty of space inside their penalty area. As pictured here, the forwards managed to exploit the gaps in the back four for Gabriel Jesus to get the decisive goal. The role of the three central midfielders was crucial for Brazil in their defensive transition. 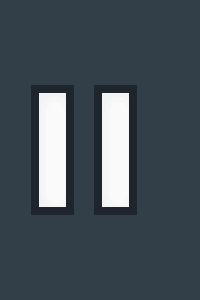 Fernandinho on the left and Paulinho on the right slowed the German counter in the channels, while Casemiro patrolled for possible receivers. 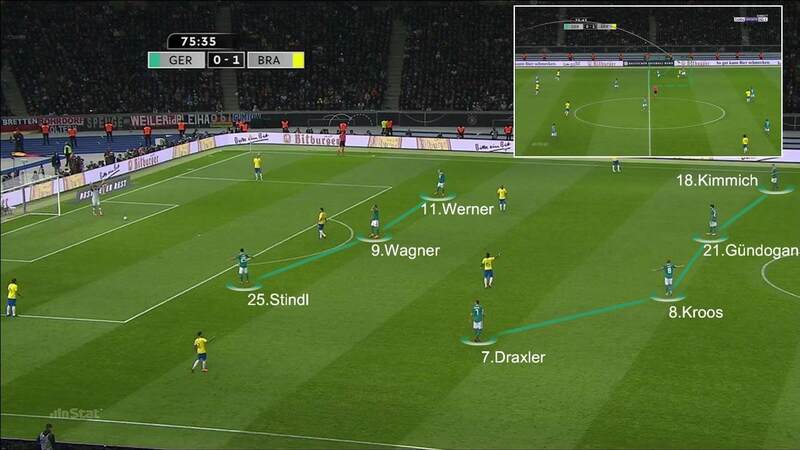 Tite’s Brazil team started in a 4-3-3 formation in attack and in defence, employing zonal marking and a high press. The ‘trivote’ formed by Paulinho, Casemiro and Fernandinho in central midfield was particularly solid, offering support for their teammates at all times. Brazil made it difficult for Germany to play through the thirds, with their three most advanced players slotting into the gaps in the opposition back line, and Paulinho and Fernandinho positioning themselves close to the German wing-backs. This tactic forced Kevin Trapp into going long in possession, often gifting the ball back to the visitors in the process. Their last line of defence suffered little threat during the game, centre-backs Miranda and Thiago Silva dealing assertively with crosses into the penalty area. They naturally came under more pressure during the second half, with Germany chasing the game – but with the help of their central midfielders they remained solid and organised, dropping deeper towards their penalty area. The role of the three central midfielders was crucial for Brazil in their defensive transition. Fernandinho on the left and Paulinho on the right channelled and slowed down the German counter-attack, while Casemiro looked out for possible receivers of the ball and, when required, was tough in the tackle. On the counter-attack, Brazil showed their ability to take advantage of the space left in behind the last line of defence. 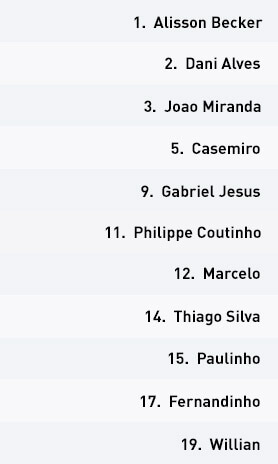 Supported by their full-backs, Willian and Philippe Coutinho attacked the vertical channels, while Paulinho moved rapidly into a gap in the opposition penalty area in order to give his side shooting opportunities. 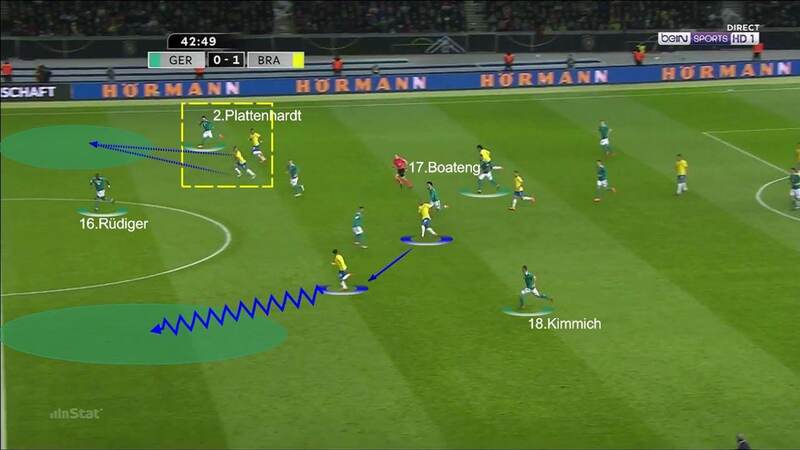 Brazil employed a range of attacking styles, alternating between a direct approach and combination play. Goalkeeper Alisson would assess the situation, trying to find the best-placed attacking player. He would then either play the ball short to his centre-backs in wide positions, or attempt diagonal balls to Willian or Coutinho. In midfield, they showed plenty of attacking intent. Their main objective was to drive the ball forward to Coutinho – who, coming in from the left flank, would cut dangerously inside. The Brazil attackers posed persistent problems for the German defence in the final third, and found plenty of space inside Trapp’s penalty area. The forwards managed to exploit gaps in the back four, with Gabriel Jesus doing just that to grab the decisive goal late in the first half. Germany could not pose any consistent threat to Alisson Becker’s goal. They were too slow to unsettle their rival defenders and failed to up the tempo in the crucial final few metres, handing the defenders the advantage. The Germans too often lost their shape while defending. 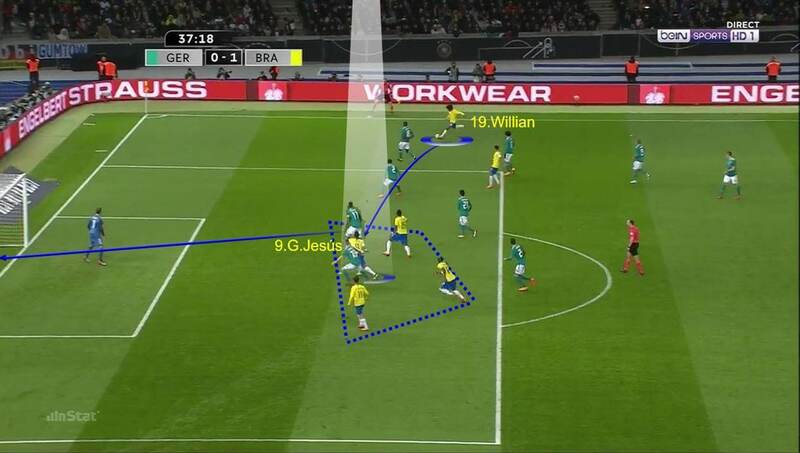 Their back four and the two central midfielders left space in between the lines, which the Brazil forwards exploited to move into shooting positions. It was Tite’s game plan to ensure Germany did not dominate the ball from start to finish. 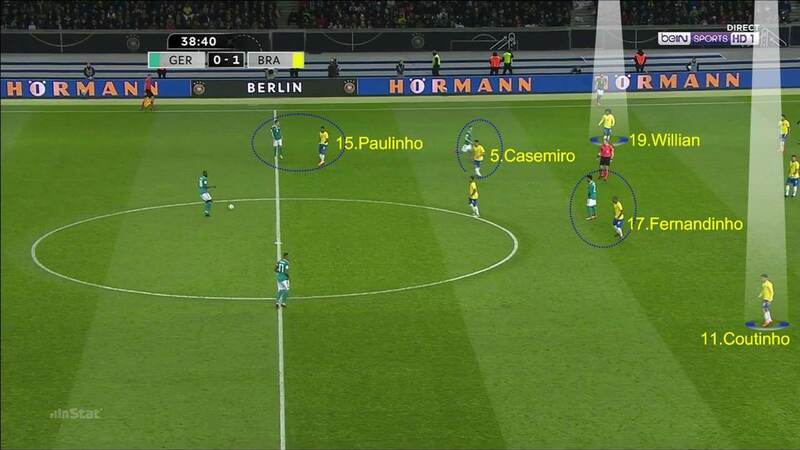 Brazil’s high press caught Joachim Low’s side out in the build-up, making it more complicated for them to get forward. 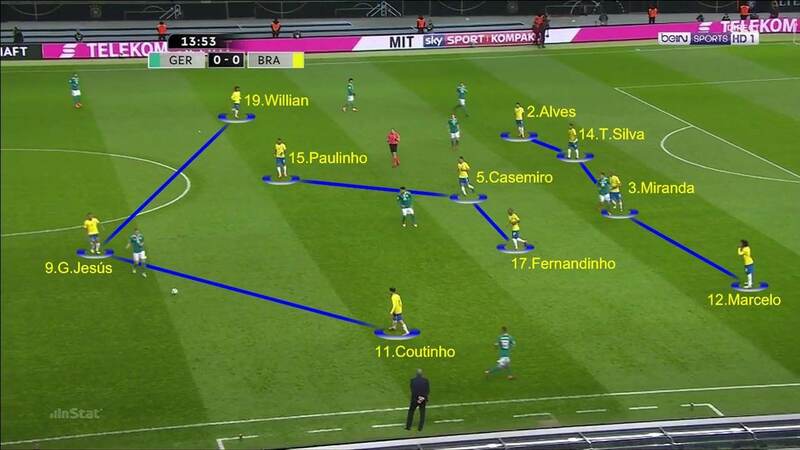 The Brazil manager made sure they were not found out on the flanks by positioning Willian and Philippe Coutinho just in front of their full-backs. This meant Germany were obliged to concentrate on moving through the central channel, where the visitors could more easily sniff out trouble. The attacking and defensive work of Brazil’s midfield ‘trivote’ composed of Paulinho, Casemiro and Fernandinho was highly effective throughout. The three Brazilians formed a solid block in the central channel and found plenty of space in possession.